Welcome to Dunster House, a family-run company, incorporated in 1994 and a leading UK supplier of Log Cabins and Wooden Garden Buildings. You have clicked 'NO' to cookies. We would love to show you our full range of products (as indicatated below), but due to the complex nature of our Log Cabins and Garden Buildings, we need to use cookie files to operate the vital functions of our website. Be assured that we treat data protection and privacy very carefully. If you prefer not to have our cookies on your system, but are interested in our range of Log Cabins, Garden Offices, Climbing Frames, Sheds, Greenhouses, Summer Houses, please contact us through the methods below to discuss your needs or arrange a visit to one of our display gardens. 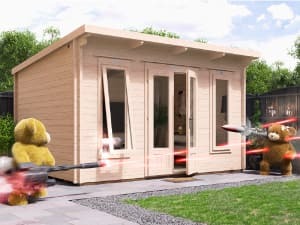 A Dunster House log cabin is more than a stylish wooden garden building, it provides an extra garden room that can have multiple uses like family room, or man cave such as games room, or garden gym etc, space for parties and entertaining, according to what is important to you and your family! With our garden offices, you can cut your commute to just a few seconds! 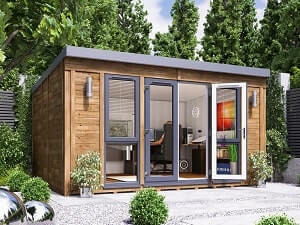 Instead of working in the busy kitchen or a cramped box room, imagine a spacious garden room, your own dedicated workspace in the comfort of the most familiar surroundings! 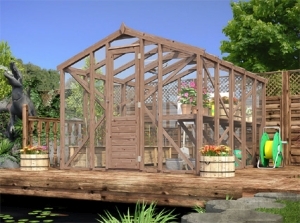 A Dunster House wooden Greenhouse, made of toughened glass and pressure treated wood, is built to last! Generous space and heavy duty staging shelves make it a great workplace. The harmony of real glass and slow-grown spruce wood turn this garden structure into an attractive feature. 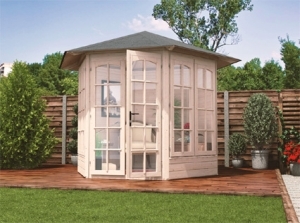 An attractive wooden Summerhouse is more than an elegant garden building, it’s extra living space, great for making the most of those long summer evenings, admiring the flower beds or as extra play space in your garden for the kids. The toughened glass we use is also football-proof! A wooden shed at the end of the garden not only provides orderly storage space, it also keeps your home or porch clear of muddy tools! 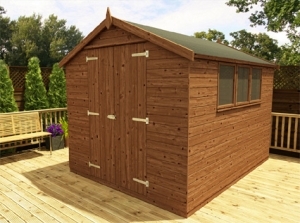 Though we offer a range of sizes, all our high quality pressure treated sheds are designed to last. Each Dunster house climbing frame meets the EN71 BSI safety standard, so you know your kids are safely enjoying outdoor play– great for mind and body! 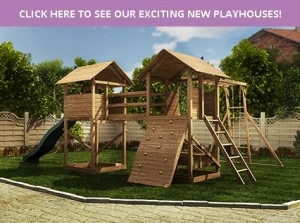 Looking for a classic children’s climbing frame with monkey bars, slides and swing sets? Or a garden fort/playhouse for toddlers? we have just the thing! 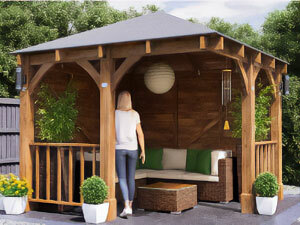 Enjoy the ultimate garden party location with one of our open-sided wooden gazebos and attractive thatched Gazebos. Natural wooden pergolas make a pretty garden feature, while Heavy Duty Gazebos keep you out of the sun or rain, or offer extra hot tub protection! 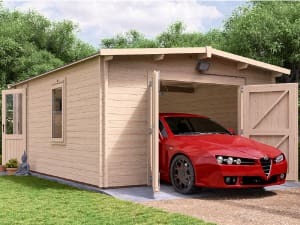 Our wooden Garages make an attractive addition to any yard! They come in a variety of heights and sizes, from small garages and carports for smaller driveways, to double garages with ample space for storing bulky items like tyres and bicycles. Garage workshops also provide useful workspace. 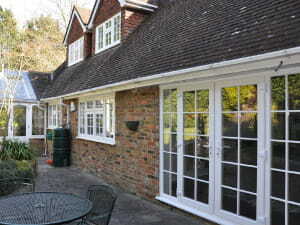 Our very first products were DIY uPVC windows and doors, so Dunster House has a lot of experience in supply only windows. We have a huge range including bay and bow windows, tilt’n’turn and French windows, as well as stable, residential and patio doors. Caution: leaving this page will unreserved the delivery date. Changing the product or any details of the order will mean the delivery dates will need to be rechecked.